The golden kiwifruit (Actinidia chinensis) is one of many kiwifruit species available for consumption nowadays. Its considerably sweeter taste and stronger flavor, in addition to its more appealing flesh color contribute to its growing popularity among fruit fanatics. The golden kiwifruit is a kiwifruit species with slightly different characteristics than the fuzzy brown variety we all know and love. Despite what its name (‘golden’) leads us to believe, the variety can range in color from green to golden-yellow and even red. 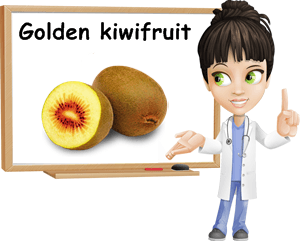 Golden kiwifruit have been shown to contain more dietary magnesium than regular kiwifruit and more potassium than the reputed banana fruit itself, thus greatly contributing to cardiovascular health. What does the golden kiwifruit look like? The golden kiwifruit is just about the size of a regular kiwifruit, has an oval shape with a pointy tip and considerably less fuzzy, almost smooth, bronze or brown skin. Golden kiwifruit have either green or golden-yellow flesh. Some varieties have a bright yellow flesh with a thick red ring in the middle, circling the seed area. For this reason, the golden kiwifruit is also popularly known as red-ringed kiwifruit or red kiwifruit, but the latter denominates an entirely different kiwifruit species. What does the golden kiwifruit taste like? Unlike the Actinidia deliciosa species (the fuzzy kiwifruit), Actinidia chinensis (the golden kiwifruit) is considerably sweeter in taste and far more aromatic, hence its growing popularity among fruit lovers. Moreover, the fruit’s almost smooth peel allows for it to be consumed whole, no peeling required. The golden kiwifruit variety is more susceptible to spoilage than the regular fuzzy kiwifruit. What is the golden kiwifruit good for? According to research, the golden kiwifruit species is a rich source of essential nutrients such as folic acid, pantothenic acid, vitamin B6, vitamins A and C, copper, phosphorus, iron, calcium, magnesium and potassium. Its vitamin and mineral content is far greater than that of the fuzzy kiwifruit, hence its beneficial effect on human health. Even more, the golden kiwifruit is an excellent source of dietary fiber and has no cholesterol. The red-ringed varieties were found to contain powerful anthocyanins that help fight free radicals and delay cellular aging. 1) Exhibits anticancer properties. The golden kiwifruit (including the red-ringed variety) is reputed to possess antimutagenic properties. It appears that golden kiwifruit contain a compound that helps prevent gene mutations triggering cancer. If you are in the habit of eating great amounts of barbecued meat, for instance, then you should know that the barbecuing process itself (grilling meat over hot charcoal or wood ashes) results in the formation of nitrosamines from the nitrites in the meat. Nitrosamines are known carcinogens and, according to research, they play a role in the development of mouth and throat cancers, liver tumors and stomach cancer. In other words, if you are a big fan of barbecues, make sure to have some golden kiwifruit with your steak. Even more, the species’ extremely high vitamin C content provides extra protection against cancer-causing mutations due to the fact that vitamin C inhibits nitrosamine formation, according to a 2015 article in the American Journal of Clinical Nutrition. 2) Helps prevent artery plaque buildup. Golden kiwifruit contain an amino acid called arginine, also abundantly found in nuts, seeds, lupine, spinach, beets, dairy products, poultry, beef and pork. Aside from working as a growth hormone, arginine plays a crucial part in the synthesis of nitric oxide, an extremely powerful vasodilator that improves blood flow as well as preserves the health of the endothelium (inside part of blood vessels) where it discourages lipid buildup. The fact that the golden kiwifruit contains 2 g of dietary fiber also contributes immensely to cardiovascular health because the dietary fiber in the fruit indirectly reduces LDL (bad) cholesterol levels by preventing the intestinal absorption of some of the fat from the foods we eat (read more about the Properties and Benefits of Dietary Fiber). 3) Rich source of lutein. Red-ringed kiwifruit, a popular gold kiwifruit variety, contains generous amounts of lutein located in the red part of the flesh. Lutein not only helps maintain good eyesight, but also acts as a potent antioxidant, reducing oxidative stress and cancer risks. What is interesting is that lutein gathers in the central area of the human retina from where it protects our eyes from the damaging free radicals in blue light. Green plants such as kiwifruit, red-ringed kiwifruit and green leafy vegetables, as well as egg yolk and yellow poultry fat are all excellent lutein sources. Below is a beautiful video of kiwifruit on their vines right before harvest time. 4) Excellent natural laxative. All kiwifruit, including golden kiwifruit are amazing natural laxatives due to their generous dietary fiber content. According to the USDA National Nutrient Database for Standard Reference, fuzzy (normal, green) kiwifruit contain about 3 g of dietary fiber, while golden kiwifruit about 2 g of dietary fiber per 100 g. As a result, eating kiwifruit accelerates an already slow intestinal transit, promoting regular bowel movements and relieving constipation. Eating 1-2 kiwifruit in the morning on an empty stomach, along with a glass of water or a cup of herbal tea, should send you to the bathroom that same day, no matter how constipated you have been. Preventing constipation is great not only for colon health, but also for your general well-being as the condition has a savage impact on psychological health. Despite being one of the healthiest fruit in the world, recommendations have been issued for diverticulosis sufferers to avoid kiwifruit because the tiny seeds may get stuck in the pouches in the colon wall and cause complications. 5) Rich in potassium and magnesium. Golden kiwifruit is a particularly good source of potassium and magnesium, the two most important dietary minerals linked to cardiovascular health. In fact, this species contains 316 mg of potassium and 29 mg of magnesium, a bit more than its green, fuzzy double (312 mg and 17 mg). Such amounts rival those of the best dietary supplements brands available made available to us in recent years, which would explain the amazing positive impact a regular consumption of the fruit would have on our cardiovascular health. Magnesium and potassium deficiencies are always associated with heart disorders and cardiovascular events (hypertension, extrasystoles, tachycardia, myocardial infarction), poor energy levels, insomnia and other forms of disturbed sleep as well as bad mood (read more about Extrasystoles: Causes, Symptoms and Treatment). 6) Contains serotonin. The golden kiwifruit variety was found to contain serotonin, a neurotransmitter known to cause good humor and feelings of well-being. For this reason, eating the fruit regularly may help improve mood and general well-being. The golden kiwifruit variety is even a better source of vitamin C than its fuzzy, green counterpart (105.4 mg vs. 92.7 mg of ascorbic acid). As it would appear, of all the fruit easily accessible to us, kiwifruit, and the golden kiwifruit in particular, are richest in vitamin C. Regular consumption thus entails a wide variety of health benefits from a significant and visible reduction in inflammation levels to maintaining cardiovascular health, boosting immunity and reducing free radical damage.